In our current age of hand-held technology, it seems that just about everyone has some type of device that shoots video. Many people make and share videos with friends and family using video hosting and social networking sites such as YouTube and Facebook. Before you go posting your video online, you might often wish to edit it, though, to make it more concise and enjoyable. 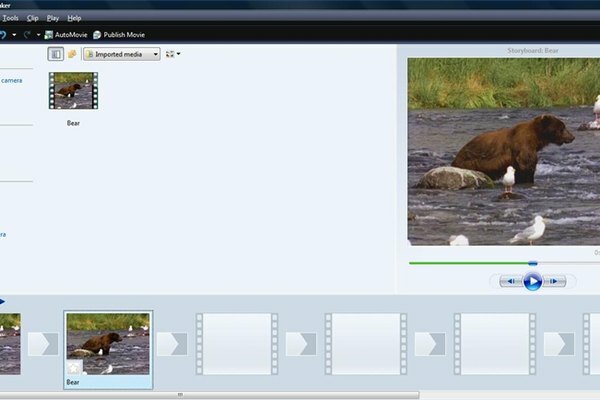 Every version of Windows includes a simple video editing program called Movie Maker. To open this program, simply click on the Start menu, then go to "All Programs". Scan the list of installed programs for Windows Movie Maker. If you don't see it right away, you may need to go into the Accessories folder to find it. Click on it to start it up. Next, import your WMV file into Movie Maker. To do so, simply click the Import Media button in the upper-left corner of the Movie Maker window. This will open a dialog box that allows you to navigate to your file. For example, if your file is located on your desktop, click on the "Desktop" shortcut on the left side of this dialog box. If you cannot find it, use the Search function in the upper-right corner. Once you have selected the correct file, double-click on it or hit the "Import" button. Once you have imported the clip into the project, you will find a thumbnail of the clip in the Imported Media area of the window. Next, drag this clip down to the Storyboard. Now you are ready to begin editing. Begin playing the clip. When you find the first edit point, hit pause. For example, if the clip starts out with the lens cap over the lens, wait until the lens cap is off and the shot is steadied, then hit "Pause". Hit the "Split" button. You will now see two clips in the Storyboard instead of one. The first clip contains the undesired footage, while the second contains the rest of your video. Delete the unwanted portion of the video. To do this, simply right-click on the first clip and hit "Delete". Repeat steps 2 and 3 for each portion of unwanted video. Remember that, if your unwanted video falls in between to sections that you'd like to keep, you'll need to split the video in two places. These are called in and out points. Once you have finished with your editing, export the movie. To accomplish this, click the "Publish Movie" button at the top of the window. This is a necessary step to produce an actual video file. In this dialog, you will be asked to select what type of output file you want, such as DVD, CD, DV camera, or email. Once you have selected this, the video will begin rendering. For additional help on working with Windows Movie Maker, click on the Help menu, then Help topics. Browse or search for the subject with which you require assistance. If you have a video file other than WMV, you may also be able to use that as well. Check the Windows Movie Maker documentation for more details. Rendering your video can take a long time, depending on the duration of the video file, and speed of your computer. Please be patient during the rendering process.